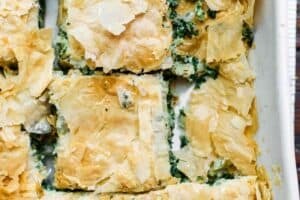 We can never have too many delicious and quick chicken recipes, can we?! 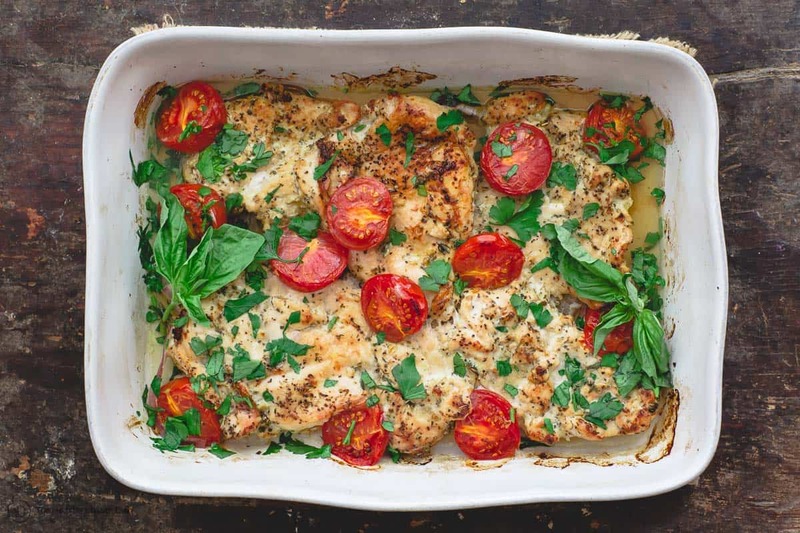 You’ll love this healthy, juicy Italian Baked Chicken Recipe. 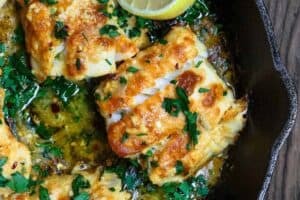 Boneless skinless chicken breasts prepared with a simple spice mixture, garlic and olive oil, and finished with fresh parsley and basil! 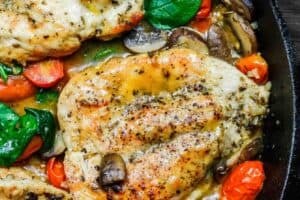 Afraid to serve dry chicken breasts? You’ve got this! Be sure to check out my tips! 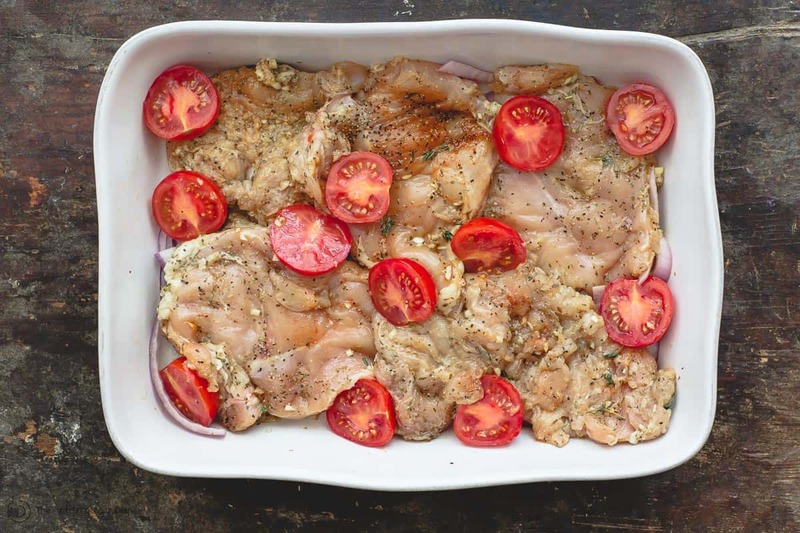 Boneless skinless chicken breasts a great source of lean protein, that’s why they are a dieter’s best friend. They are also convenient. 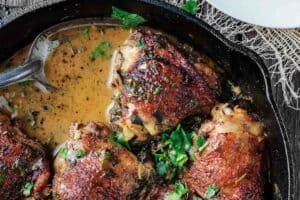 They may even look less intimating to cook than say bone-in chicken thighs (this cilantro lime chicken is my favorite thigh recipe, by the way). But, even renowned chefs will tell you that boneless skinless chicken breasts are the least forgiving. Let’s face it, they can just be plain boring and, often times, dry. 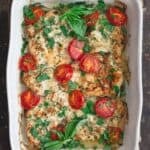 Not this Italian baked chicken recipe. 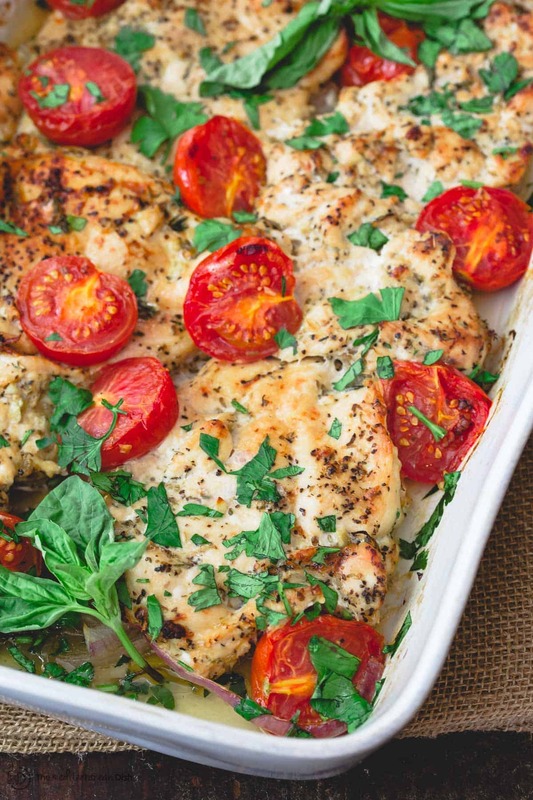 Just a few tips ensure this easy baked chicken recipe is flavorful and juicy. You’ve got this, trust me! 1. Pound the chicken. I’m a big fan of pounding chicken breasts into thinner, more evenly flat pieces; it helps it cook faster and more evenly. 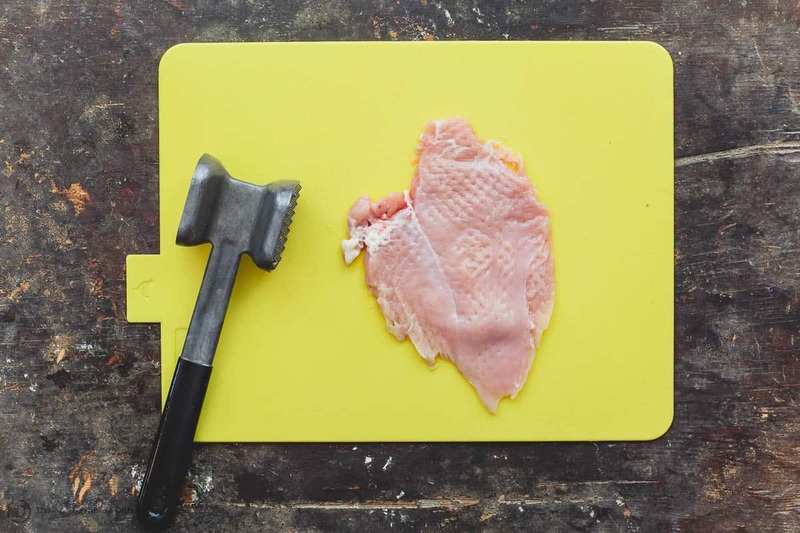 And by pounding, you’re also mechanically tenderizing the chicken breast, which means you’ll end up with a juicer and tastier chicken dinner. 2. Add Enough Flavor. To begin with, be sure to season chicken breasts well on both sides with salt and pepper. Then, layer more flavor in the form of spices and aromatics. 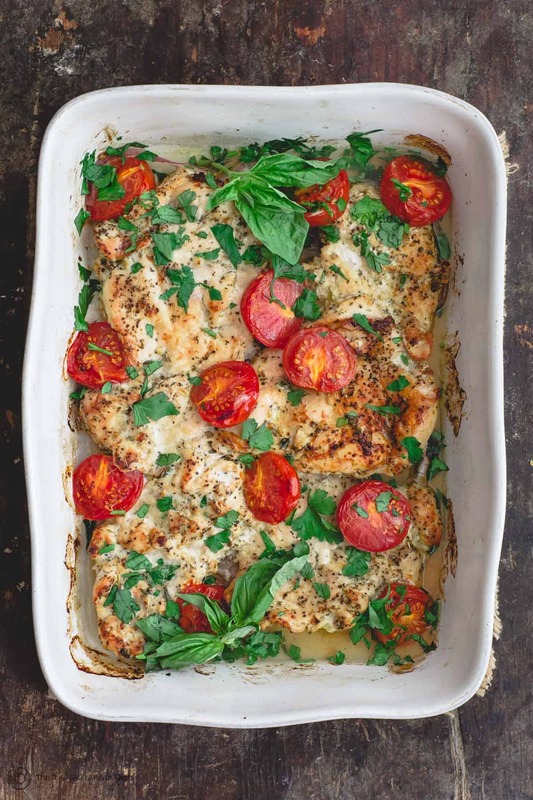 I use a simple mixture for this Italian baked chicken: oregano, fresh thyme and sweet paprika along with fresh minced garlic. 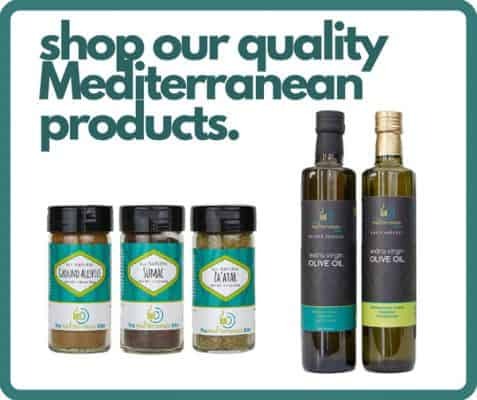 To bring everything together, a generous drizzle of my favorite Early Harvest extra virgin olive oil and a splash of lemon juice. The key is to toss the chicken well to coat evenly with the mixture. And if you leave it just for 10 minutes or so, this little bit of time helps the flavoring process. 4. 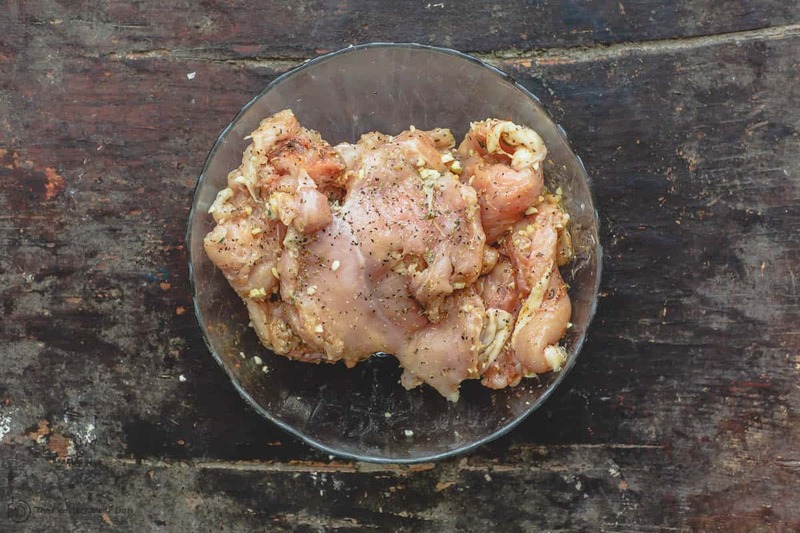 Let Chicken Rest Before Serving or Slicing Through. 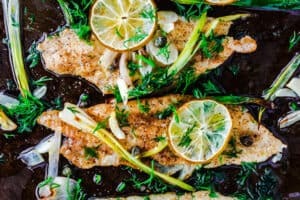 This is a known rule, just like with a good steak, once chicken breast hits that magic 165 degrees F, remove from heat and let it rest for 5 to 10 minutes so that the juices redistribute. And this time, I actually covered the chicken while it rested. I’ve found that to work even better. 2. Season with salt and pepper, then combine with remaining spices and fresh garlic. Add a generous drizzle of Early Harvest extra virgin olive oil and juice of about 1/2 lemon. Work it! Make sure chicken is well coated with the spices etc. Don’t forget. Remove from heat and let chicken rest for 5 to 10 minutes (you can cover it during this time). Garnish with fresh parsley and basil. 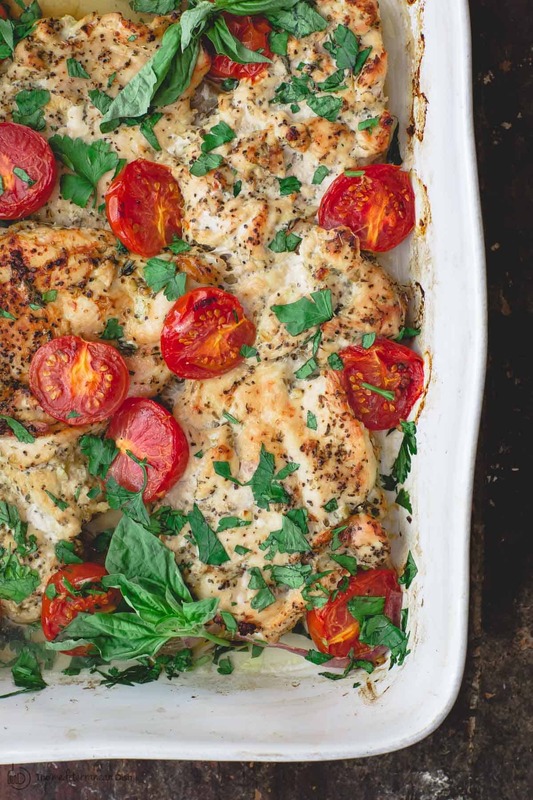 There are endless sides and salads I can recommend with this baked chicken. This easy Mediterranean olive oil pasta carries similar flavors and the same sorta theme. Other sides I love: this simple grilled zucchini salad; roasted potatoes; or the obvious choice, Italian roasted veggies. (Prepare the sides ahead, since the chicken takes little time to cook). Oh dear ! With you all the way ! Grazie milla !